I sat inside a beautiful church -- Storkyrkan, a cathedral in the heart of Stockholm. The lights dimmed and the crowd grew quiet. Everyone knew what was about to take place. And while I didn’t understand a word of Swedish, I, too, knew I was in the middle of something special. Suddenly the choir director gave a swift signal and a fleet of young women and men dressed in white started singing in unison. Their melody resonated through every corner of the church and vibrated against my skin. For the next 50 minutes I was enchanted. On December 13th swedes young and old come together to celebrate Lucia’s Day. The charming celebration involves processions of lights all across the country. They happen at schools, churches, hospitals and offices. These processions feature a young woman or a girl dressed in a white gown with a red sash tied around her waist. She also wears a unique wreath crown with lit candles on her hair. She’s the chosen one to represent Lucia and is accompanied by a group of maidens and star boys. The maidens also wear white gowns with a red sash, but instead of a crown with candles, they wear wreaths with berries and hold a single candle in their hands. The star boys wear the same white gown and red sash, as well as a large, pointy hat decorated with stars. They sing carols together, bringing a warm and cozy feel to an otherwise cold and dark winter day. The festival originated in Italy hundreds of years ago. 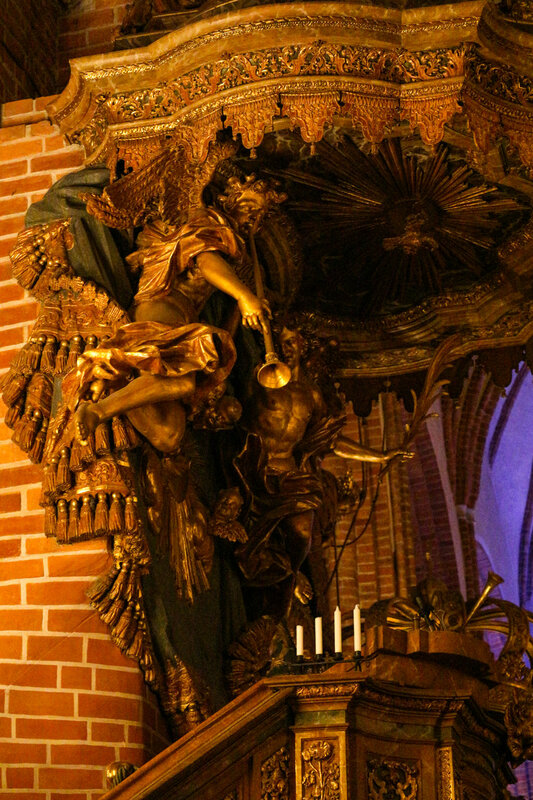 Santa Lucia represented light in what was thought to be the darkest night of the year. In fact, the first Lucia celebration recorded in Sweden dates back to the 1700s, but became popular nationwide in the 1900s. Today it is one of the most celebrated traditions. Saffron bun. Photo: Julie Cid. Additional to the procession and singing, there’s also one particular sweet bread bun that accompanies the celebration. The Lussekatt, or saffron bun. This bun can be bought at coffee shops, outdoor markets and bakeries everywhere during the holiday season. 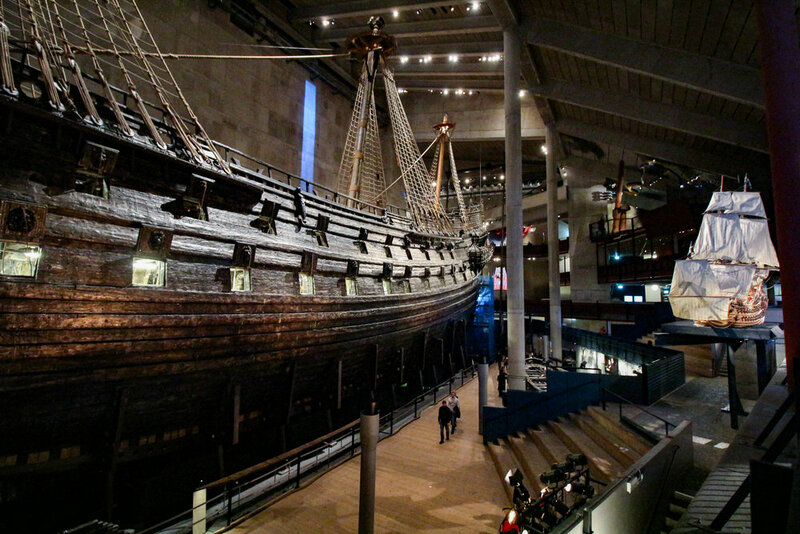 Vasamuseet, or Vasa Museum, is the most visited museum in Scandinavia according to its website. 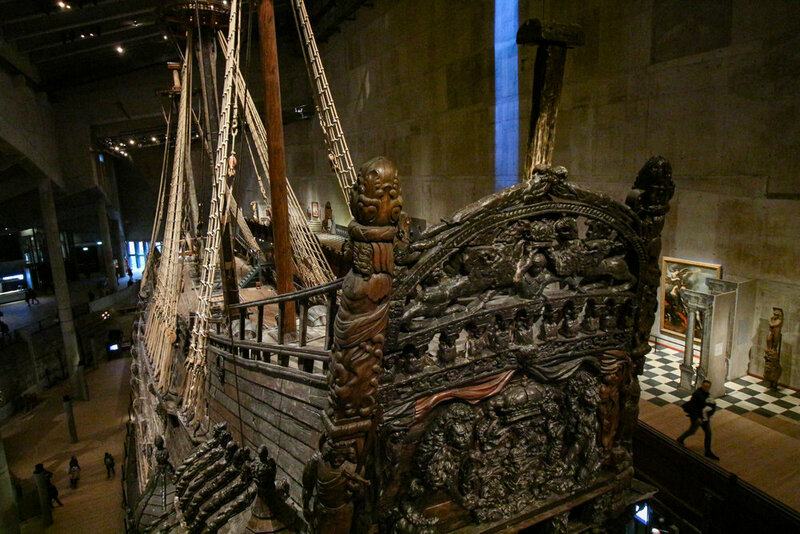 The museum is unique in that it only holds one centric piece in exhibition: The Vasa. 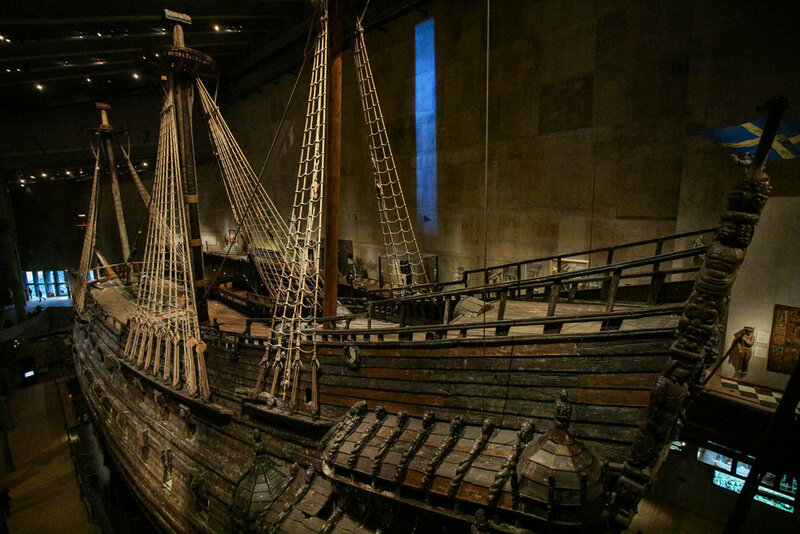 This majestic ship was commissioned by King Gustav II in the early 1600s. It was a warship, build to fire over 500 lbs of ammunition from each side. It carried 64 cannons, 300 soldiers and 145 sailors. However, just as strong and powerful its rise, so was its demise. As crowds gathered to watch the ship leave the harbor, they witnessed the unthinkable. 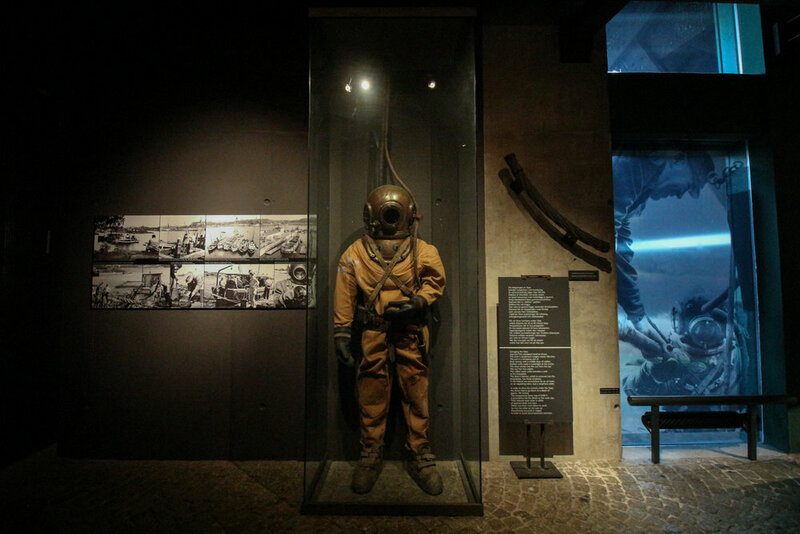 The ship sank in its maiden voyage on August 10, 1628, just 20 minutes after sailing. All but 30 of its passengers survived. The day after the accident the Council of State and the King started looking for the responsible parties and started an Inquest. However, no one was ever punished or held responsible for what happened. Today, it’s believed that faulty design was to blame in the tragedy. After all, ships of that size and capabilities were unstable and susceptible to the technology of the times. 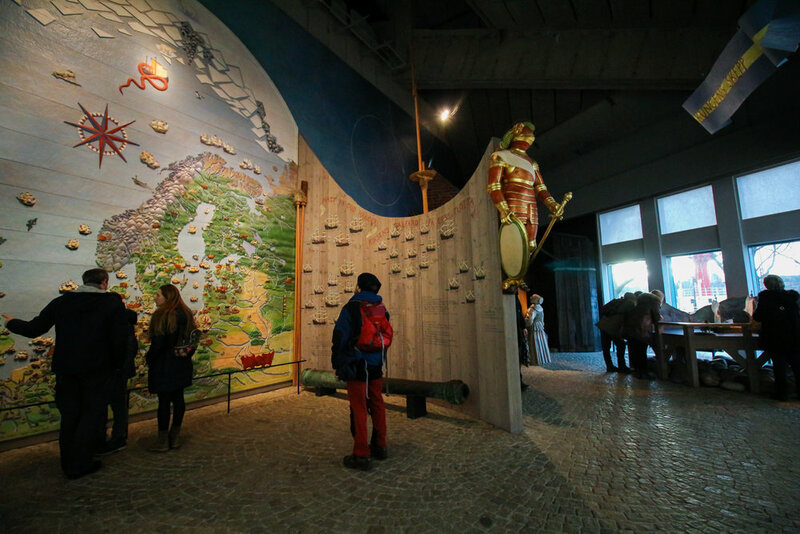 The vessel remained lost in the cold waters of the Baltic Sea for hundreds of years. 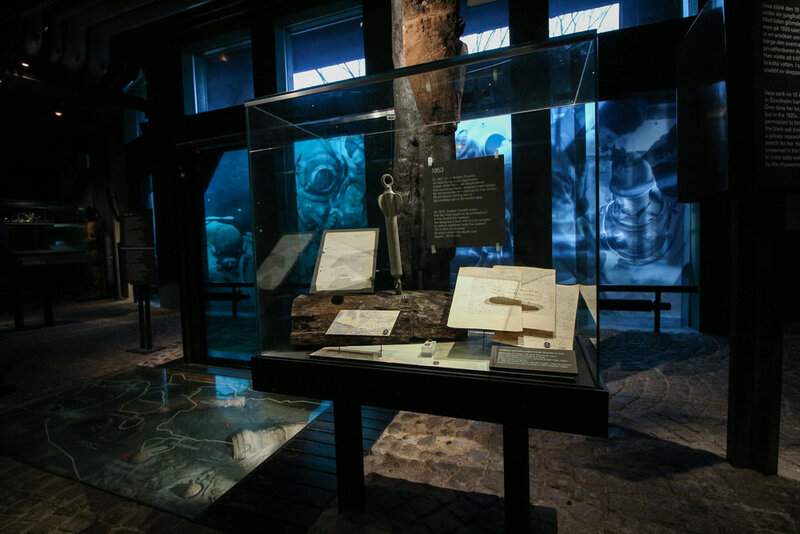 It was 333 years later that a team of expert divers were able to raise and restore the ship. Today the wooden ship is well above water and protected by a massive concrete building tailored to keep it safe. The sky is gray and a thick fog hangs well below the clouds, yet somehow this adds a touch of vibrancy to the place. This is Hangzhou, China. A city of over 9 million people. A small city by Chinese standards, but one with big traditions and rich with folklore. I hopped on a traditional river boat and cruised the West Lake to hear the legend of the Leifeng Pagoda. The pagoda has become a tourist destination since it was rebuilt 4 years ago. But it’s tale dates back to 925 AD, when it was originally built. As the story goes, a white snake disguised herself as a beautiful woman and fell in love with a young man. They fell hard for each other and finally got married. However, because she wasn’t really human, their love was forbidden. So the gods trapped her under the Leifeng Pagoda for eternity, or until the pagoda crumbled to the ground. In 1924, that’s exactly what happened. The Pagoda collapsed and the old tale regained its fire. Today thousands of people visit the new pagoda and take river cruises around it to admire its history. China. A small word with huge meaning. The flavors. The culture. The architecture. The history. From the moment we landed at the Shanghai airport it was clear to me that this was going to be a completely different and unique experience. The modern architecture of the airport was unlike anything I’d seen before, with white poles holding onto the blue tent-like ceiling. In this trip I got to explore Shanghai, Beijing, Hangzhou, Wuxi, and Suzhou. Each city offered a distinct perspective into Chinese culture, deeply rooted in old traditions yet also embracing modernity and looking forward to the future. First, let’s talk population. I used to think that being one of the 8.4 million people living in New York City made me a part of a huge city. Little did I know that’s just a “medium-sized” town by Chinese standards. Shanghai has a population of over 24 million people. Beijing has 21.5 million people. Hangzhou, Wuxi and Suzhou are considered medium-sized towns and each count with a population of around 8 to 10 million. That’s a lot of people. But the size of the population is only comparable to the size of the land itself. We took a flight between Beijing and Shanghai and it took us about three hours of driving on average to get from Wuxi to Hangzhou, and then from Hangzhou to Shanghai. The country is huge (about the same size as the USA) and the fact that the culture and old traditions are so alive and strong throughout makes it even more amazing. This is a place where the notions of old and new are constantly in balance, almost like a ying-yang dance everywhere we went. And it is the most clear through architecture. A walk on the Bund, Shanghai’s waterfront promenade, is the perfect example. Here you’ll spot some of the world’s most exuberant buildings. The Oriental Pearl TV Tower, probably the most recognizable one, features two giant round structures, one at the base and another at the top, with pinkish-red stripes across them. The Jin Mao Tower, a huge building that houses the luxurious Grand Hyatt Hotel, with it’s diamond-shaped top. Then there’s the Shanghai World Financial Center, a huge skyscraper with a glass-walled observation deck. A quick 7-minute drive from the Bund lands you in Yuyuan Garden. The garden was finished around 1577, during the Ming Dynasty and still holds its traditional architecture. The rounded gates, the ponds full of huge koi fish and the traditional decorative rockeries. Just outside the garden there’s a bazaar where you can buy traditional Chinese items like silk pieces, tea, pearls, jade and handcrafted jewelry boxes. This is also where the Lantern Festival is held every year. The Lantern Festival is one of the most interesting cultural events I was able to witness. It takes place 15 days after the Lunar New Year and gathers people from all over the city admiring the intricate paper lanterns in Yuyuan Garden. The tradition was already one of great significance by the Han Dynasty (between 206 BC - 25 AD), marking the final day of the New Year celebrations. Today, it still holds the same importance with red paper lanterns spread throughout the city. The lanterns have evolved from the traditional round shape to handmade lanterns that mimic life-sized animals, sceneries and cartoons. At night, they light up leaving children, as well as adults, in awe. Each one a symbol of good luck for the year ahead. The Chinese New Year traditions are still very important to the people, most of whom leave the city to be with their families for the weeks leading up to and after the day. For many this is the one long vacation they can spend with their parents and relatives in their hometown. Another huge part of the culture is the food. From outdoor markets to food halls to restaurants well-equipped with lazy Susans, delicious food is everywhere. One of my favorite street-snacks was a round pastry filled with cooked radishes and another one filled with pork slices. They are serve in folded parchment paper, to make them easy to carry. Family-style meals are also a big tradition in China. We grew accustomed to using the lazy-susans at pretty much every restaurant. It was a great conversation starter! We ended up getting to know new people much better because of the family-style lunches. It’s a must try, at least once! This trip to China was a life-changing experience. I learned so much about the culture, the people, the history. I loved every minute of it and will be posting more detailed guides about each one of the cities in the next few weeks. There was so much to take it. One trip to China is simply not enough. Have you been to China? Tell me about your experience in the comments! You know that last scene, when Rue finally finds what she’s been searching for. We see Luke Skywalker wearing his signature Jedi cloak on an island so beautiful it can only be described as otherworldly. The green pastures between rocky hills that stretch directly into the ocean. The dome-shaped structures that served as homes to the monks who lived there hundreds of years ago. The majestic view of a smaller sister island located only a 2 kilometers away that is populated only by birds. It was a beautiful look into a breathtaking location. The good news is this place wasn’t brought to you by CGI. It’s a real place and it’s not in a galaxy far, far away. It’s in Ireland. Skellig Michael, also known as the Great Skellig, is one of those places so majestic and historic that you really don't think you will ever be able to see again. A once in a lifetime sort of thing. So when I saw it for a second time on the big screen, I got really excited. I was probably happier to see it than Luke. I visited Skellig Michael in the summer of 2013. My cousin, a friend of ours and myself were on an all-girls road trip through the Emerald Isle. We drove to the little town of Portmagee and dared to face the rugged Irish Sea in a tiny vessel with fewer life jackets than I would like. All to see Skellig Michael from just a few feet away. You're probably wondering, what's the big deal with this little island? For me there are three things that make the Skelligs so especial. 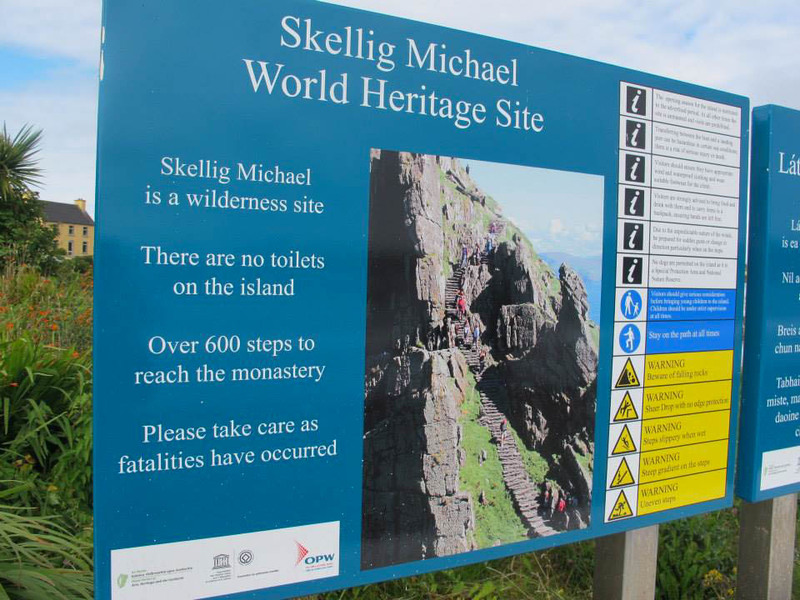 Their History - Skellig Michael served as a monastery during the Middle Ages. A place where monks found themselves getting closer to God. For many monks this was a one way trip. Not only because of how tough it was to get there, but also because of how rough it was to stay there. The monks lived in beehive shaped huts that would have to stand through incredibly challenging weather. Even today to visit the remains of the monastery you’ll have to climb 618 steps (over 180 meters). Their wilderness - These islands are home to a wide variety of seabirds, including the puffin, a chubby black and white bird with a bright orange beak. There is also a colony of over 30,000 gannets living in Little Skellig (the largest colony in all of Ireland.) 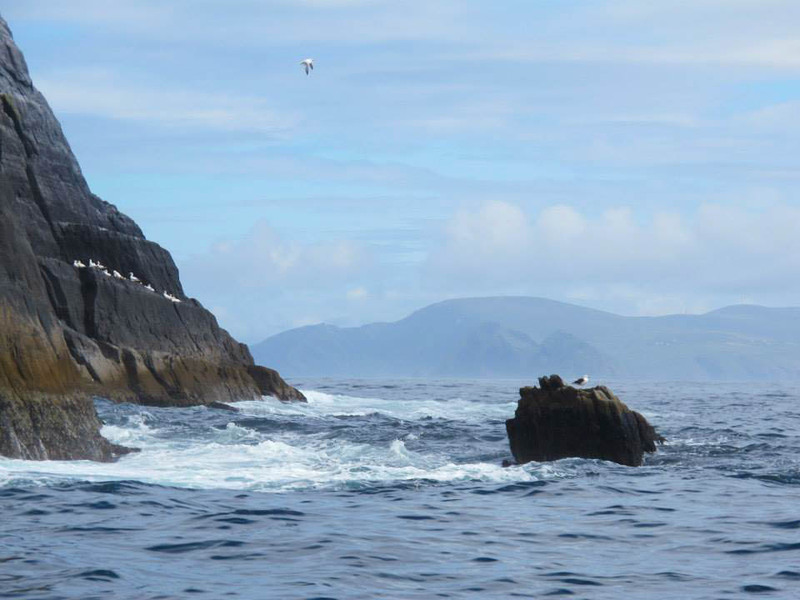 It is said that the birds don’t allow people to disembark in Little Skellig, keeping the island all to themselves. 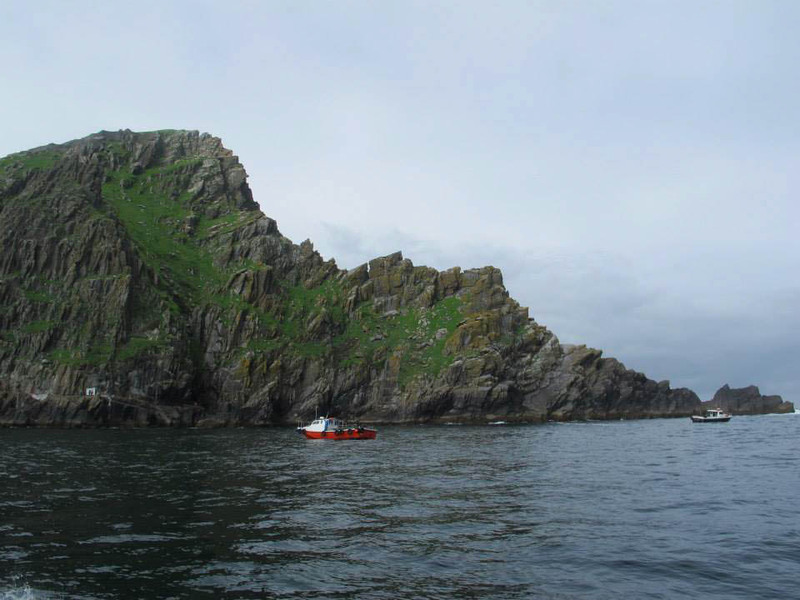 Their location - While Skellig Michael is only 12km off the mainland, the Irish sea is extremely volatile and makes for a gruelling boat ride. There are a limited amount of boats licensed to make the trip and all go out very early in the morning, weather permitting. Many days the sea is just too rough to venture out. So, you’ll definitely need a little luck of the Irish to make it there without sticking your head off the side of the boat once or twice. Skellig Michael is a Unesco World Heritage site for a reason. If you're ever in Ireland I highly recommend the trip. Make sure you're there early and maybe the forces of nature be with you, so the boats can depart.